I arrived back in Manila last night, exhausted and honored to be part of the first ever Road Revolution. 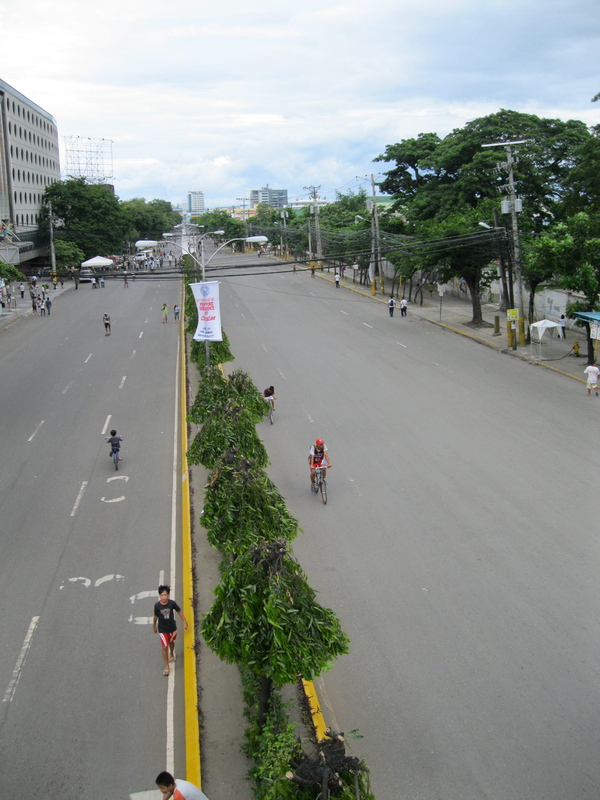 There is nothing like seeing a multi-lane road, usually congested with air pollution and traffic, filled with longboarders, families biking and runners streaming past in flocks. I was amazed by the turnout and support of the thousands of petition signers and various organizations. And here I am at Week 4. The last time I arrived in Manila airport was a Tuesday in May, time zones away from the US, I thought as I munched dried mango slices on my way to the airport. What do they say about time flying? But the theme about time moving and catching up with us doesn’t just apply to my trip to Cebu. It also applied to my father and his recent discovery of an old acquaintance. That is the way it is with parents. Moments before you label your father’s travel stories as crazy and far-fetched, something happens that forces you to reconsider. When my father traveled to Cebu as a young man, he met a man named Stu Gould. Stu was a diver like my father and the two of them enjoyed many fond memories on the beaches of the Philippines. When I told my parents I would be spending a week in Cebu, he googled “Stu Gould” and e-mailed a man with the same name, who currently owned a resort in a similar place to where they had met. My father wrote about the Stu he knew, how he collected tropical fish, was an ex British Diver and had (at the time) been living in Cebu for a short while. Was this new Stu Gould, the mystery man of the past? I was skeptical at best. My father would probably see my eyes rolling from across the ocean. That was years ago. It’s impossible. I’ll be believe it when I see it. “Hi Ken! Long time no hear! Yes it is I Stu Gould,” it read followed by a nice description of the last 30+ years detailing Stu’s return to the UK, birth of his 4 kids, and decision to build and run the Granada Beach Resort now 100 km south of Cebu. He personally invited me to take dive lessons and spend time at the resort during my travels throughout the Philippines. Go figure. Lesson: The next time your father tells you he may have recovered a long lost British diving friend from the small island of Cebu in the Philippine archipelago, just believe it. He’s probably telling the truth. HAAAAAAAAHAHHA. what theeeeeeeee, that only happens in movies.